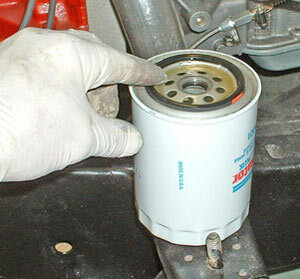 Ideally, oil filters can be grabbed by one's hands and unscrewed. This almost never happens because the filter has become coated with a thin film of oil and grease, not to mention how tightly it was put on in the first place. That means you need a wrench. Special wrenches are available for use specifically on oil filters. You can buy a sleeve-type wrench, chain wrench, strap wrench or socket wrench for the job and, frankly, we have several types and sizes at the Second Chance Garage. 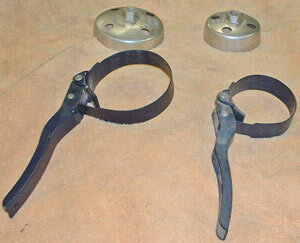 A couple of socket wrenches and strap wrenches that we use to change oil filters. Which wrench you use is determined by the clearance around your filter. If things are really tight you might opt for a socket-type filter wrench, but otherwise the metal sleeve-type wrenches work well because they have long handles for leverage. Wear latex or work gloves, because this will almost certainly be messy. Wipe off the filter with paper towels or rags. This takes off most of the oil/grease film and helps the wrench grab. Next, place a basin (plastic bowl or oil drain pan, if you have one) under the filter to catch the oil that will drain from inside when you get it loose. 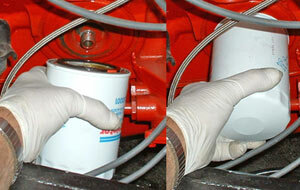 Removing the oil filter. As you can see, it does get pretty messy. Put the wrench on the filter and turn hard. The filter will start to move slowly, eventually freeing up enough to take it the rest of the way by hand. Oil will start to run down the sides of the filter, so keep the catch pan handy. Once the filter is off its threaded post, invert it into the catch pan to drain the oil out. 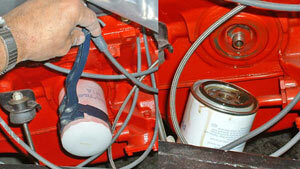 An important step is spreading oil over the rubber gasket. Wipe off the filter mounting post/plate with paper towels or a clean rag. Next, take the new filter out of its box and spread a few drops of fresh oil over the entire surface of the rubber gasket. This is very important, so don't forget to do this. Carefully start the filter on its post and tighten hand tight. Now screw the filter on its post and run it up to the gasket plate. Once it snugs up, turn the filter an additional 3/4 turn to tighten it. Read the instructions on the filter or its box, because there are a few filters that require additional tightening. NEVER use a wrench to tighten the filter. Doing so will warp the gasket and leaks - or total failure - will result. There! You're done, except for turning on the engine and checking for leaks after a couple minutes. Oil filter lore is filled with all kinds of opinions, techniques and caveats, but two are very common. The first is: should you fill the filter with fresh oil before installing it? The answer is "yes," if it's possible to do so without the oil spilling out as you install it on the engine. The fact is, most filters are mounted at a steep angle or upside down, so putting oil in is a waste of time - and certainly oil. If you can fill it, do so, but otherwise don't worry about it. The second common question is: how do you get a filter off when the wrenches keep slipping or they crush the outer surface of the metal can? That's a much harder question, because each filter location has its own approach. Generally speaking, however, an effective approach is to puncture the bottom of the filter to drain the oil, then puncture through the sides with a screwdriver and use it as a turning handle. This will either release the filter or tear it apart. If the filter is torn apart, use the screwdriver as a drift and hammer its blade into the top edge of the filter, tangent to its circumference. This will eventually get the filter loose, but care must be taken to avoid hitting the gasket surface on the engine.